Leave the M27 at Junction 3, joining the M271 heading towards Southampton. At the Redbridge roundabout take the 1st exit on to Redbridge Road (A33). Keep in the right hand lane continuing over the Millbrook flyover (A33). 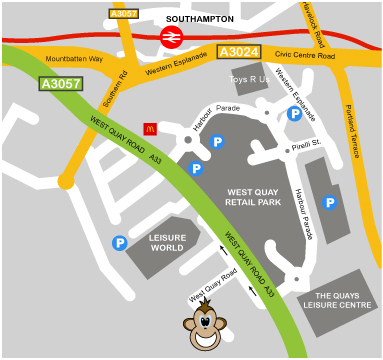 At the 2nd set of traffic lights bear right towards Dock Gates 4-10, on to West Quay Road (A33). At the next set of traffic lights continue straight, following West Quay Road (A33). At the 3rd set of traffic lights turn right on to the (one way) West Quay slip road. Turn left in to West Quay Road. Jungle Jeans is immediately in front of you.